This old recipe for Caramel Apple Cake has been in my family for years. It's quick and easy and perfect for fall's first apples. The aroma of this cake baking in the oven evokes memories of crisp cool days and scuffing through the leaves on the way to school. It's perfect for an after-school treat. Did you know that certain types of apples are better for baking and cooking, and other types are better for eating out of hand? 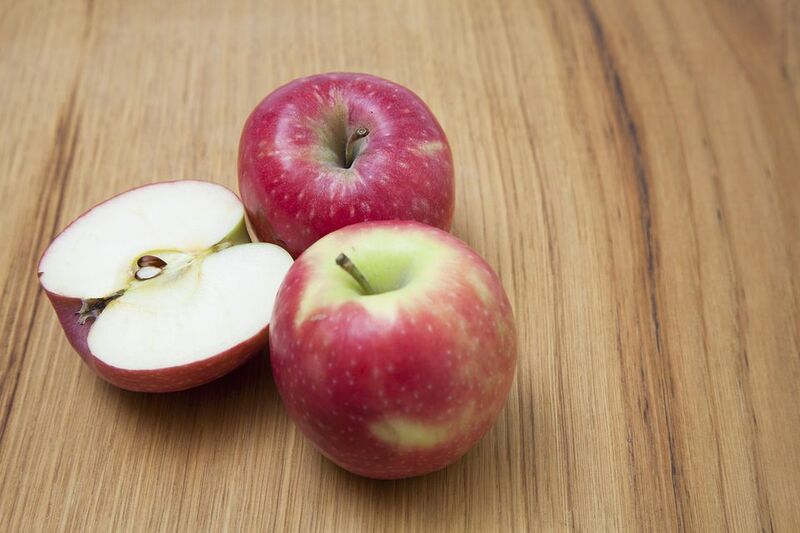 The main rule is that Red Delicious apples, the most common type found in the grocery store, is not good for baking. I prefer using Granny Smith, MacIntosh, or Braeburn apples for baking. Their sweet-tart flavor and tender texture work well in this cake. The apples melt into the cake, but still stay separate for a wonderful taste and texture. As always, be sure to measure the flour and other ingredients carefully for this recipe. Baking is a science. That means that all of the ingredient amounts are calibrated to work together well. If you add too much flour or sugar, or not enough baking powder or baking soda, the cake will not rise well and may be tough or gummy. This cake keeps well for a couple of days, if you have any left! Serve this wonderful cake with a big glass of cold milk. And enjoy every bite. Preheat oven to 350°F. Grease the bottom only of a 13x9" pan and set aside. In a large bowl, combine flour, brown sugar, sugar, cinnamon, salt, baking powder, baking soda, vanilla, butter, and eggs. Beat on medium speed until the batter is smooth, about 2-3 minutes. Then stir in the apples and pecans by hand. Spoon the thick batter into the prepared pan and spread evenly with the back of a spoon. Bake the cake at for 30-40 minutes or until a toothpick inserted in center comes out clean; or until the cake springs back when lightly touched with fingertip. Cool the cake completely in the pan on a wire rack. Frost the Caramel Apple Cake with Caramel Frosting and let cool until the frosting is set. Cut into squares to serve.